Like all living things, plants need water to survive. Many plants cannot tolerate salt because it interferes with their cells' normal function. Some plants can tolerate salt water because they have adapted by using reverse osmosis. Reverse osmosis allows a plant to use a selective membrane to keep the salt from interfering with normal processes needed for growth. The Halimeda plant (lamouroux) is also referred to as the cactus algae. It is a fast-growing algae that can be found growing in the ocean floor. It has flattened, segmented leaf structures and grows in large groups to form an algae mass at the bottom of shallow waters. The Halimeda plant reproduces by spores and grows very quickly. Turtle grass (thalassia testudinum) is a sea grass that typically grows about 16 feet into the ocean. It produces a small, yellow flower, and germination from turtle grass usually takes 14 days. Some turtle grass will grow as far as 45 feet into the ocean's floor. Turtle grass requires a large amount of salt for its survival. It is the most common sea grass in Florida. The red mangrove (Rhizophora mangle) is a tree that grows in coastal habitats with saline conditions. Mangroves usually grow together in groups that are referred to as mangrove swamps or mangrove forests. 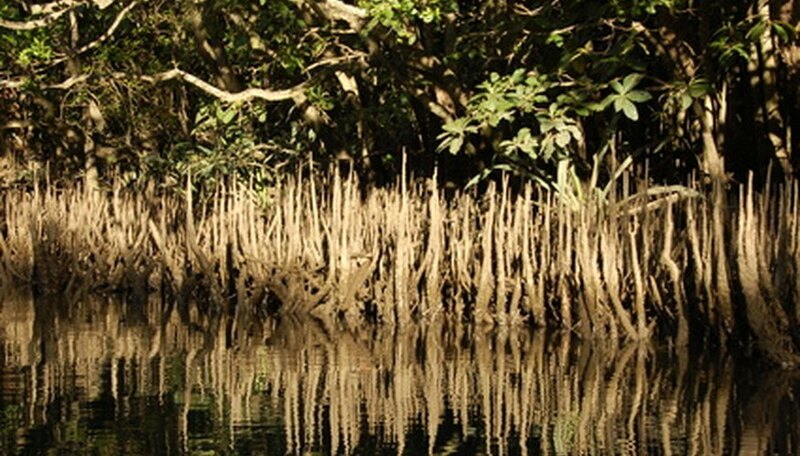 Mangrove roots provide an excellent habitat for oysters and other ocean life. These trees can survive heavy amounts of sea water due to their impermeable root system. The leaves of the mangroves have salt glands that secret the salt out of their systems. Lettuce algae (Ulva lactuca) is a green algae that grows 6 inches to 2 feet long. The leaves are ruffled and look similar to those of regular household lettuce. Lettuce algae is frequently washed ashore by strong tides and often grows in tidal pools. It prefers to live in water that is up to 75 feet deep. Lettuce algae can tolerate waters that are heavy with bacteria and can often be found in areas where sewage runoff is heavy. Which Algae Are Not Considered to Be Plants?